In the recent times, IBA has been taking a stand that they do not have mandate from the banks for discussing and resolving the retirees’ issues. This stand of IBA is neither reasonable nor consistent with the stand that was followed by them in the past. IBA only negotiated with the UFBU for extending one more option for pension. Based on the mandate given by the bank, IBA discusses and finalize the wage revision and other service conditions. Terminal benefits are linked with wages and hence the mandate given by the banks has an inbuilt character that facilitates discussion on pension, gratuity, encashment of leave, PF etc. In reality no issues is a retirees’ issue. All the issues of the retirees’ are in the nature of residual issues that should be discussed by IBA with the UFBU and the decisions arrived should form part of the bi partite settlement / joint notes. In fact these issues are to be discussed with retiree associations too. The IBA is a 70 year old body with 237 members comprising of public sector banks, private sector banks, foreign banks having offices in India, co operative banks, regional rural banks and all India financial institutions. One of the objectives of the IBA is to organize co ordination and co operation on procedural, legal, technical, administrative or professional problems and practices of the banks and the banking industry. When such a responsibility is cast on IBA they cannot disown their responsibility on the pretext of alleged lack of mandate. General Rationale for our demands Retiree organizations especially AIBPARC have been waiting patiently for early resolution of their issues most of which are settled issues. Sanctity of settlements and respect for statutory regulations have been the casualty and the retirees have been worst hit due to withholding of implementation or unilateral suspension of extension of settled and/or statutorily provided benefits. Even court rulings on policy issues are not implemented forcing every affected individual to seek legal redress thereby making the national litigation policy mockery. When issues settled themselves are discarded there is no wonder many other understandings on which minutes have been signed are not even in the reckoning. It has to be noted that the pension scheme in banks is strictly and not just broadly on the lines of the pension scheme of the Government. This is the reason why DA neutralization periodicity and frequency being half year is as obtaining in Central Government though the serving employees of banks are getting DA revision every quarter on quarterly average. Pension as third benefit was denied and extended as a second benefit in lieu of PF only because Government employees are having Pension as a second benefit. After the introduction of Pension Scheme in 1995, all subsequent recruits were brought under pension scheme with no option for them to choose pension or PF because Government employees are all under Pension scheme only. It is not mere understanding but every part of pension scheme that was framed was made identical to the Central Government Pension Scheme. It is ironic that settled issues became issues of further negotiation in the Record Note signed by the IBA and the serving employees’/ officers’ unions without the consent of the affected parties i.e. retirees represented by their Organizations. As we have no more time on our hands to wait we place the following charter of demands and request IBA to hold negotiation with our organization on these demands for immediate resolution. 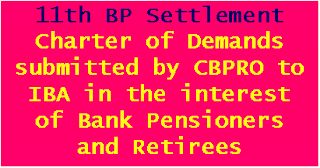 Before discussing each item of demand affecting the interest of bank retirees, we like to reiterate that all employees and officers of the banking industry who joined the bank on or after 1st April, 2010 and who are now under the New Pension Scheme should be brought back under the purview of Bank Pension Regulation, 1995. 1 A. Pension Updation – Pension is revised with every Pay Commission for Govt. employees whereby the pension of retirees of past years are brought to closer to the pension of current retirees having the benefit of latest pay commission. Similar updation was agreed to be provided in the pension settlement signed in 1993. This was duly incorporated in the Pension Regulations under Reg.35 which provides for updating pension as per formula given in appendix-1. The formula given in appendix 1 is nothing but the formula obtaining in Central Government in 1986. As the only persons who required updation at the time of implementation of pension in 1995 were those who retired under IV Bipartite Settlement and their pension was updated by notionally revising their pay in line with V Bipartite Settlement Pay. However the pension updation that was agreed, provided for and implemented was discontinued unilaterally. However the government is updating the pension of their retirees at every Pay Commission and have also started upgrading their pension after the age of 80 where a pensioner reaching the age of 100 years get his full pay updated as pension. Bank retirees are not even getting pension updation, not to speak of pension upgradation though the bank’s pension scheme was framed on the lines of government pension scheme. 1.B. Pension for State Bank of India Retirees is presently either 50/40% of the last drawn Basic Pay depending upon the grade in which an employee retires. This also is subject to a ceiling on the maximum amount of Basic Pension payable. SBI pensioners have been demanding for uniform pension @ 50% of last drawn pay without any ceiling on the maximum amount of basic pension to be drawn. 2. 100% DA Neutralization – This is also a settled issue that was faithfully implemented till 2005. The pension settlement signed with workmen unions under ID Act provided for DA neutralization as per formula obtaining in RBI from time to time and so also the MOU signed with officers provided for DA neutralization as per formula obtaining for serving officers. The DA formula has a slab system of neutralization where the pay range falling within the first slab gets 100% DA neutralization and the subsequent slabs get tapered DA neutralization. Full Pay range of Sub-staff and almost full Pay range of Clerical staff and a part of Pay range of officers falling within the first slab were getting 100% DA neutralization. The slab system followed all along was as per RBI formula. In 2005 the VIII Bipartite settlement was signed providing for 100% DA neutralization for the entire pay range abolishing the slab system with effect from May, 2005 to all those who retired on or after 1/11/2002 in line with DA formula obtaining in RBI. Subsequently RBI amended its scheme to extend 100% DA formula retrospectively from May 2005 to all the past retirees. However banks failed to implement this amended RBI formula in disregard of the settlement. So uniform 100% DA neutralization has to be extended to all past retirees too with effect from May,2005. 3. Family Pension – When bank pension is framed on the lines of Government pension scheme Uniform family pension at 30% of pay without ceiling as obtaining in Government and in RBI should be extended to banks too. As the scheme exists, family pension payable to wards will be too negligible because it is very rare for pensioners to have wards drawing family pension. So mostly the spouses would only be family pensioners and in fact many pensioners would have no spouse alive or wards eligible to draw family pension. Even the spouses alive may not have long life expectancy which on an average may be less than 10 years. Inasmuch as pension ( at 50% of pay) itself is provided for the full life span of every employee as per AS 15(R) standards and family pension sought at 30% without ceiling should not entail any additional cost. With every death the provision already made at 50% of pay becomes excess and banks would be able to write back the excess provision. So only a portion that would be written back has to be spent to give family pension at uniform 30% without ceiling which will not impact the profits of the bank in any way. Further the number is too low and it is also inequitable to have discriminatory percentage for family pension alone while pension for every pensioner is a uniform 50% of pay without ceiling. We demand therefore uniform 30% pay without ceiling as family pension as obtaining in Government and RBI. We further demand that the unmarried and financially dependent daughters of pensioners should be made eligible to get family pension in line with the provisions of central government pension. 4. IBA Medical Insurance Scheme- Govt. of India asked IBA to formulate a medical insurance scheme for retirees. It was no where mentioned that retirees would have to pay annual premium for getting insurance cover for self and spouse. The premium which was initially fixed was considerably high ; it was more than doubled on the 2nd year. Retirees throughout the country are extremely worried about what is going to happen in the next occasion when the renewal of the policy becomes due. The situation for family pensioners and subemployees are really pathetic and for other pensioners, it is beyond their financial means. Our demand is that the premium to be paid by retirees should be completely waived as it has been done in case of working employees. We further demand that the physically and mentally challenged daughters and sons who are otherwise financially dependent on their parents should come under the cover of the group mediclaim policy. The number of such persons will be very minimal. Further retirees who could not join the scheme due to lack of communication should be allowed to join the scheme. 5. Welfare Fund Generally Banks with Staff strength of above 20000 staff are allotted 20 crores as welfare fund and banks with less than 20000 staff are allotted Rs.15 crores. 25% of the fund is generally spent for retirees. However, in extending the benefits different practices are followed by the banks. Some extend the benefits to superannuated retirees only denying the benefits to those voluntarily retired. This discrimination should be put to an end. The benefits may be made available to the superannuated retirees and to those voluntarily retired too. To ensure uniformity and to counter the stand of the some bank managements, that extension of welfare benefits to those voluntarily retired would serve as an incentive to them to leave the bank before attaining superannuation, the benefit can be extended to those voluntarily retired after they cross the age of 60. A separate welfare fund can be constituted for taking care of the administration of welfare fund applicable for the retirees and retiree representatives may be nominated to manage that welfare fund. 6. Extending one more option for pension to resignees In case of Banks like Vijaya Bank, Indian Bank, Dena Bank, etc. there is no provision for Voluntary retirement under service regulations. As a result the officers were compelled to resign even after they complete 20 years of service when they decide to leave the bank. As a result around 2000 resignees could not get pension option and thus pension has been denied to them. 21 resignees from Vijaya Bank succeeded legally by going up to the Supreme Court and got option to join their pension scheme and they were allowed to draw pension. But Vijaya Bank refused to extend this option to other similarly placed resignees in their Bank. This is the fate of other bank resignees too. The problem is confined to 6 banks. The stand of the Vijaya Banks and other banks is as per the guidance of IBA. This is unfair and runs contrary to the national litigation policy. When facts and circumstances are same, the national litigation policy requires the benefit of one judgment should be extended to the others. As a result good numbers of petitions are pending before various courts. It is time that IBA comes forward to resolve the issue by issuing administrative guidelines. 7. Extension of one more option of pension to those compulsorily retired : In terms of Discipline and Appeal Regulations applicable to the Bank Officers, Compulsory retirement is a beneficial provision when compared to dismissal or removal from service. The intention of compulsory retirement is to protect the terminal benefits. However, when one more option for pension was extended as per the 9th Bi Partite settlement, pension option was denied to those who were compulsorily retired. A compulsorily retired officer from Andhra Bank moved the court up to Supreme Court level and got a favourable judgment that he should be provided option to join the pension scheme. It is learnt that the Andhra Bank Management had allowed this petitioner to join the pension scheme. It is learnt that similar thing of extending the Pension option to the petitioners only under this category took place in several other banks also. In all such cases respective bank management have gone upto the level of filing SLP before Supreme Court to deny the pension option. But all the SLPs were dismissed. Huge money was spent on these litigations which should have been avoided. The provision of national litigation policy requires the compliance of the same. However pension option is still denied to those compulsorily retired in banks. Here again the provisions of national litigation policy is disregarded. IBA is fully behind this stand. As a result quite a number of cases are pending before various courts. It is unfortunate IBA should come forward to resolve the issue through issuance of administrative instructions. 8. Extension of one more option of pension to left outs When one more option for pension was extended in accordance with the 9th Bipartite settlement, some PF optees could not join the scheme due to communication gap. They have given authorization to transfer the Bank contribution of PF to the pension fund, but did not provide the additional contribution that they have to deposit in their SB accounts. As a result their pension option was rejected. These kinds of cases are pending in some Banks. Through Bi lateral discussions with the Offices Association and the Employees union and taking up the matter to the board, PNB Management resolved the issue for 456 PF optees. In other Banks, these categories of people are forced to approach the courts and good numbers of cases are pending. IBA should come forward to resolve this issue once for all by providing the option to all these left outs to join the pension scheme. 9. Redressal of grievances of SBI Associates : Even when sick banks are merged, the employees of such banks enjoy the benefits of the bank with which it is merged. It stands to reason that bank mergers between two healthy banks should not result in adverse service condition to the employees of the bank which get merged. We know that all associates of SBI with profitable business merged with SBI. The employees of Associate banks shall have to be treated at par with the employees of SBI and the existing benefits in their erstwhile banks should also continue as compensation for the cultural shock and other handicaps they are subjected to. 10. Sanction of PL encashment to those compulsorily retired : Banks were not sanctioning encashment of PL to those compulsorily retired. This facility was stopped at the instance of IBA. Some compulsorily retired Officers from Canara Bank and PNB approached the court and got favourable judgment in all the courts inclusive of the Supreme Court. Supreme Court allowed interest also for delayed payment. Under this background IBA issued a communication advising the banks to allow PL encashment to those compulsorily retired on or after 30.04.15. The stand of IBA was strange. Later on IBA took a stand that individual banks may decide on this issue. So far PNB, BOB, UCO bank and Bank of India had allowed this benefit. Other banks are yet to resolve the issue. On a common industrial issue, this kind of happening runs contrary to fair play and justice. IBA should direct the banks to permit PL encashment to those compulsorily retired with applicable interest. 11. Sanction of Compassionate allowance Bank employees’ Pension Regulations provide for payment of compassionate allowance in the case of those who are dismissed or removed from the service. The provision remains as a discretion of management. It appears that the bank managements did not implement this provision at all. It may be appreciated here that Bank employees and officers surrendered the Banks contribution of PF (with which pension fund has been created) and joined the pension scheme. Quite possibly if these categories of people would not have opted for pension and remained as PF optees they would have got the Banks contribution of PF. The compassionate allowance is a provision similar to the one applicable to the Central Government employees. It is learnt that the Central Government has issued guidelines that the Disciplinarily Authority who awards the punishment should make a mention about the compassionate allowance in the speaking order itself. But in the case of Bank employees and officers no system or mechanism is in place for implementation of this allowance. Clear cut operative guidelines are to be issued by the IBA in this regard and some financial relief should be provided to this category of staff. 12. Sanction of Gratuity to those who are facing external action after retirement : Pension Regulations prevent the payment of gratuity in the case of those who are facing external / judicial action by CBI, etc. after retirement. In the case of Bank employees and officers, gratuity is worked out based on Service Regulation and as per payment of Gratuity Act 1972 and whichever is higher is paid. The Pension Regulations are in the nature and character of subordinate regulations and the payment of gratuity act prevails over the subordinate regulations. Hence the gratuity as per gratuity act should be made available to those who are facing external /judicial action after retirement. Bank Managements are unrelenting on this issue. In fact this regulation itself has to be squashed or to be withdrawn as no issue is pending for this category of staff as they are allowed to retire. 13. Retirees should be allowed to appear as defence assistants for defending the retirees : Regulation 42 to 48 of Pension Regulation provide for taking disciplinary action against the pensioners till 4 years from the date of retirement. In some cases Major penalty proceedings by way of departmental enquiries are ordered. These officer retirees at times find it difficult to get defense assistance as retiree officers are not allowed to appear as defence assistants. In some banks retiree officers are allowed to take up the role of defence assistant. IBA may be urged upon to issue explicit and uniform guidelines permitting the retiree officers to appear as defense assistants for defending the retirees who are subjected to departmental action. 14. Provision of office space for retiree association. Various Central Government establishments are providing office space for pensioners associations. Most of the pensioners associations in banks are operating from the residences of the functionaries as they are not able to afford to pay rent and hire the premises. As a gesture, goodwill measure and respect to senior citizens, pensioners association may be provided with office space to carry on their activities. 15. RRB Sector : we demand that all employees and officers of Regional Rural Banks should be brought under the purview of Bank Employees’ Pension Regulations since all of them are now enjoying the same salary structure and service condition of the sponsor banks. 16. Private Sector Banks : Although such banks are members of IBA, the banks have denied the right of 2nd option to pension to their employees and officers who had gone on VRS inspite of provision for second option in the last settlement. This anomaly and unfair denial should be corrected and 2nd option for pension should be made available to them. 17. Special Allowance of X Bipartite Settlement to reckon for terminal benefits including pension The fundamental principle of all wage revisions upto 9th Bipartite Settlement has been merger of DA upto a date prior to the Settlement period with basic pay with some step up wherever possible to augment the terminal benefits which are deemed deferred wages. With the introduction of uniform 100% DA neutralization in 8th Bipartite Settlement mere merger of DA is not going to cause an increase in the basic wages (i.e. 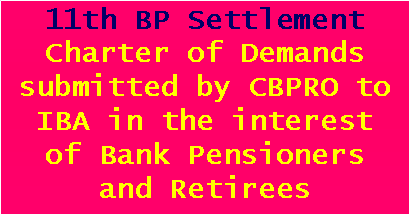 BP + DA) excepting terminal benefits like pension which are linked to basic pay. In these circumstances merging only a small portion of DA into BP and converting a major portion into Special allowance payable only during service and not for terminal benefits is not legitimate and lawful. Any pay component that reckons for DA and which is not paid for any purpose is only pay by whatever name it is called. A wage component that is Pay cannot be termed an allowance when it is not paid for any special purpose and is paid to every employee. As per Gratuity Act DA has to be reckoned for payment of gratuity. So DA paid on special allowance cannot be excluded for payment of gratuity. It will be an anachronism if DA on special allowance will reckon for gratuity but not the Special allowance. Such anachronism and illegality is because of conversion of Pay through a fiction into Special allowance and its exclusion from terminal benefits. This is illegal and an anomaly and has to be rectified immediately. 18. Revision in Gratuity is to be done w.e.f. the date of notification by Government of India. 21. Universal application of Judgements of Hon. High courts/Supreme Court of India in all identically placed retirees/employees should be done uniformly and the routine way of going for appeal upto supreme court should be avoided. 23. Setting up structured forum of Grievance redressal for Bank Retirees at Industry and respective member Bank level should be done : in some of the banks the grievance redressal system is yet to take a shape. All such confusion will go away if the negotiation tier at IBA level is streamlined with the retiree organisations at a periodic level. 24 Representation to Retirees on Pension Funds / Welfare Funds of member Banks should be done. 25. Interest free Festival advance to Retirees repayable in monthly instalments is to be allowed at every bank. Retirees have to undertake family obligations at the time of festivals. They should not be kept outside the purview of a benefit which they enjoyed throughout their entire service career. 26. Leave fare Travel facility to retirees once in 4 years should be done. Many retirees in the yester years of their life try to find out some time for visiting the holy and religious places in India. Their ex-employer may come forward with sympathy and favour to its past employees. 27. Compassionate employment to be expedited as the families of the deceased retirees are living a life of misery after the death of the sole bread-earner. 28. Interest on loans should be charged at par as it is done in case of serving employees. 29. All other unsettled issues raised in the last charter of Demands submitted to IBA. Should be resolved. 30. Discussion on charter of demands and its reasonable resolution should be completed within a definite time frame.